So I’m rolling out a new feature here on the blog! It’s called “Inspired Ideas” and it’s for the brides out there who need a little bit of fabulous inspiration for wedding day plans. There are SO many great wedding blogs out there with so many great ideas…and while it is terrific that there is so much out on the interwebs for brides these days, it can also be a little overwhelming I’m sure. How can one bride ever keep up with all the info? So I’ve decided to highlight, on a regular basis, some of my favorite ideas, color palettes, templates, downloads, and DIY projects that I’ve come across in the blogosphere, and hopefully point my brides in the right direction for some super cool wedding inspiration! 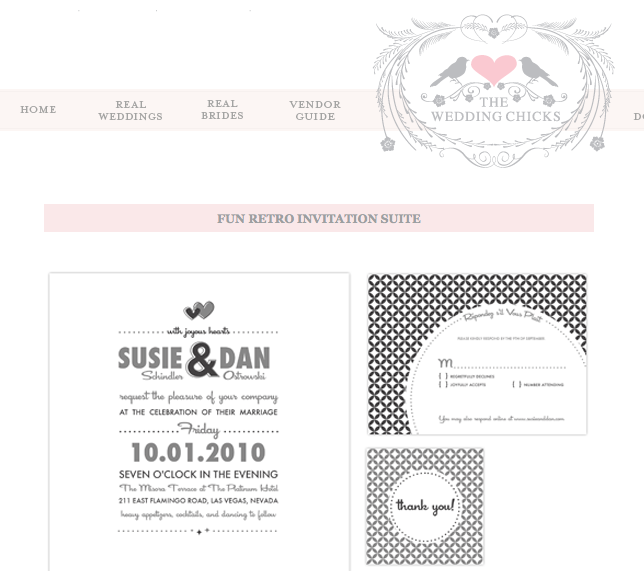 Click here to download your customized retro wedding invites from the wedding chicks now!